Donald Macleod is widely regarded as one of the greatest pipers of the 20th century, both in terms of his competition prowess and as an outstanding composer and arranger of memorable pipe tunes. 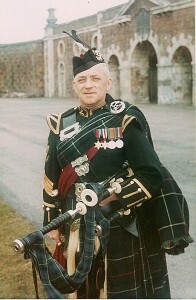 He was born in Stornoway in 1916 and initially taught the pipes by his father, Donald “Doyle” MacLeod, pipe major of the Lewis Pipe Band, before going on to be tutored by two of the greatest piping teachers of their time, Pipe Major Willie Ross and, for some 27 years, John MacDonald of Inverness. In 1937 he enlisted in the 2nd Battalion Seaforth Highlanders, where his pipe major was the famous D R MacLennan. Donald became pipe major after just four years and during the Second World War saw action in France with the 51st Highland Division and was taken prisoner by the Germans at St Valery. He managed to escape during a forced march and was picked up by the Resistance and placed with some other Scots escapees. The only Gaelic speaker among them, the story goes, he responded in Gaelic when challenged and was presumed to be eastern European. He made it back home, returning to France and eventually piping the 7th Seaforths across the Rhine – against the orders of his CO.
During the post-war years, while still in the Army, he became a force to be reckoned with on the competition circuit. Between the late 1940s and early 1960s, he won the prestigious gold medals for piobaireachd at Inverness and Oban and eight clasps from the Northern Meeting, as well as eight silver stars, the top march, strathspey and reel award. Among his musical influences he would cite great pipers and tunesmiths such as GS McLennan, Peter Macleod and John MacColl, but he also absorbed traditional song and fiddle and accordion music. As an outstanding composer, Donald could call on considerable powers of melodic invention, sometimes at astonishingly short notice. The story goes that at the Northern Meeting one year he had only written two of the four parts of his subsequently famous jig The Seagull, but entered it in the light music competition nevertheless, improvising the last two parts on the platform. Similarly, on another occasion, while waiting for the competition judges to come to a decision, he picked up a programme and started writing on it. By the time the results were announced, he had composed another enduring jig, The Judges’ Dilemma. His tunes would invariably be almost complete in his head before he consigned them to manuscript, and he was a severe judge of his own material, often scrapping compositions which would have pleased less exacting ears. Happily, a prodigious number of compositions got past this critical screening to embed themselves in the Highland pipe repertoire – marches such as Dr Ross’s 50th Welcome to the Argyllshire Gathering, the strathspey and reel written for his daughters, Susan MacLeod and Fiona MacLeod, jigs including The Seagull and Glasgow City Police Pipers and hornpipes like Pipe Major George Allan and Crossing the Minch. He was also an inventive arranger of established tunes such as I Laid a Herring in Salt or the Thief of Lochaber. As well as six published collections of light music, he produced a volume of his own piobaireachd, at a time when original compositions in the genre were often regarded askance by purists. As William Donaldson has written, these compositions, “swept through the staid ceòl mór scene like a breath of fresh air”. Donald made a memorable farewell appearance in 1977, sharing the bill with his old friend and piping colleague Duncan Johnstone at the annual Glasgow recital of the Scottish Pipers Association. He was made an MBE the following year for services to piping and is remembered fondly as a patient, encouraging and kindly figure. In his memory, the Donald MacLeod Memorial Competition was established in Stornoway in 1994, an annual competition to which some of the world’s finest competing pipers are invited. Initiated by the Lewis & Harris Piping Society, its stated aim is to honour “one of the best all-round pipers of the 20th century”.